About us - Benvenuti su isoladeltorrone! 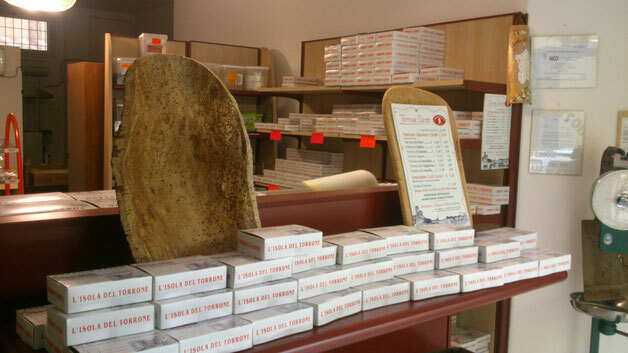 Isola del torrone is a small workshop that produces and sell high quality nougat. It starts from an idea of Mario and Alessandra who in 2002 decided to go away from Pattada, their origin's country , and move to Alghero to learn the art of the production of Sardinian nougat. The passion for this sweet leads them, after several years of training and sales of a product of others, to open his own workshop in Alghero, via Perpignan. In 2013 they decide to move in the current laboratory and shop in Via Sant'Agostino 77, where you can admire the work and the passion that everyday they put into their work . Over production of the classic nougat made with honey and almonds or with honey and nuts (sold in their stores and online shop on this site), they produce some varieties of nougat: with myrtle (done with berries harvested and processed carefully that are also used to make the famous myrtle liqueur), honey bitter strawberry tree (arbutus honey is used as a bitter taste but delicate), licorice (flavored with pure licorice), lemon (using strictly lemons of our land and untreated), Nutella and chocolate.